I don’t like writing about Nigeria. 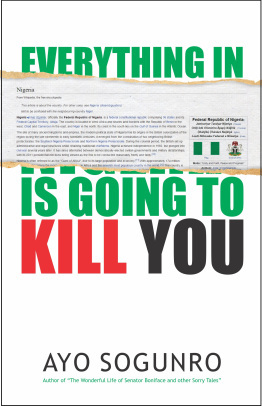 I try to shy away from writing about Nigeria and her problems. The reason is not far-fetched really. Even a visually-impaired person knows that the country’s woes are self-inflicted. With a leadership that constantly seeks ways to outdo itself when it comes to incompetence and a set of followers who lament everyday, but in the same breath defend the political class who subject them to untold hardship, it’s difficult to believe we aren’t suffering from a collective Stockholm Syndrome. The more our government and political class subject us to different forms of abuse, the more we are wont to vote their ilk when election day arrives. A couple of days ago, I read the statement issued by the Eko Electricity Distributing Company where it informed residents of some parts of Lagos of an impending nine-hour power outage that would occur on Monday, and I automatically scoffed at the sheer incredulity of the news. It was also amusing to me because in the past couple of weeks electricity supply has been far below even its usual terrible standard. Why inform people who never have power at all that there’d be an outage for a “mere” nine hours? I remember when the then governor of Lagos State, Babatunde Fashola declared that erratic power supply would only be a thing of the past if PDP is voted out of power. PDP has been out of power for almost 2 years now, yet the power situation is nothing to write home about. But even that is child’s play compared to the socio-economic distress the nation is currently going through. Southern Kaduna has been the hot bed of violence for sometime now. Every other day there’s some fresh attack by alleged Fulani herdsmen on hapless residents. The killings have gone unabated. A situation that should have been nipped in the bud when it was obvious it would likely fester to other parts of the country since the invasion of some farmlands in Benue last year. And just when we thought that was the worst that could possibly happen, the preposterous news that a bomb had been accidentally dropped on the poor residents of Rann IDP camp in Bornu State broke. That was the height of it! How on earth does a military plane discharge bombs from the sky in error? How? People who were in dire straits already, displaced from their homes and torn apart from their loved ones now had even more to worry about. It’s hard to accept it was one huge error like the military would have us believe. Kidnappers are having a field day taking people people hostage in different parts of the country. Even more distressing is the fact that these daredevils are now focusing on our children. It is now common to hear news of kidnapping in schools, the latest being the kidnap of some students and staff of Nigerian-Turkish International College in Ogun State almost 2 weeks ago. The depressing state of affairs shows just how unsafe the average Nigerian is in his own country. Even though these set of people have now regained their freedom, who or what’s to guarantee that there won’t be a recurrence in another location in the next couple of days or weeks? We have been sold a pseudo-change. A dummy change, marked by a faux, selective anti-corruption war. Allies of the government who have been accused of corruption have their “sins” waved away. As each day passes, the Buhari administration reveals more and more that it is incapable of finding a solution to the myriad of problems that plague the country. What we have instead is a president who doesn’t deem it fit to pay a visit to the victims of the “accidental” bombing or even address his people to allay their fears on the present state of security, rather opts to take a vacation in the midst of all the chaos. The prices of many goods and services have tripled, while purchasing power reduces by the day. Unemployment remains a major problem. Crime is on the increase, and power supply is almost non existent. There are even talks of an imminent increase in the prices of petroleum products, and it makes me wonder if or when we are ever going to get angry enough to demand more from our government. The 2012 “Occupy Nigeria” movement which was the closest thing to the semblance of a revolution that could force our leaders to shape in or shape out was sold for a”plate of porridge” by con artists masquerading as activists. We blew hot, we chanted and marched on the streets, but we didn’t have the much needed staying power to make something tangible happen in the long run. When I was a little girl, the sight of people trekking some distance within the neighbourhood to fetch water, or for those who were a little more comfortable, employ the services of “Mai ruwa” (the guys from the north who fetch water for families to make a living) was a regular part of our lives. Decades later, nothing has changed. Very few Nigerians have running water in their homes. Those who do sourced the water themselves by digging their own borehole. Our roads are still death traps. An overwhelming number of youths are still unemployed. Our lawmakers don’t care about the recession as long as they still get to enjoy their fat salaries, allowances and paid vacations with their families while the rest of us roast in this jungle called a country. To add insult to injury government plans to probe the hosting of Big Brother Nigeria in South Africa, as if that’s even supposed to feature on our list of priorities. Young Nigerians who are supposed to be leveraging on their population to get rid of the “Old Order” by voting them out and taking up leadership positions are busy hurling insults at one another and jumping on meaningless hashtags on Twitter, posting silly filtered photos on Instagram, and showcasing fake lives on Facebook. The PDP vs APC Twit fights are still in full swing almost 2 years after the last general elections. We staunchly defend the same baby boomers who got us into this mess for a few wads of cash; mortgaging not just our future, but those of our children. We love our kidnappers. We worship our abusers. We are not ready to take our destiny into our own hands. We are suffering from Stockholm Syndrome, we just don’t know it. Nice one sis. Your write-ups alway gives room for deep reflection. Despite all i still like to believe the present government has what it takes. You really are a super man to still believe in this government. I do not share that optimism unfortunately, nut I sincerely hope you’re right. If this administration succeeds at the end of the day, we’ll all be the better for it. Thank you for contributing sir. Nice write up exposing the situation of the country in a challenging way that demands a position. My thoughts on the government and the situation of the country is mixed with anger, a strong hope and query. Anger that we are where we are as a nation which is tied to leadership from many many years ago. Strong hope that things will get better and not just from the perspective of faith but maybe(just may be) this government will discover a solution that will pick up the economy. Queries for the present regime’s unfulfilled promises, slow action and response, lack of control over the security of the nation etc. I guess it will be appropriate throw in a word of encouragement and comfort by letting us in the reality that true change is found in Christ Alone. The strength and comfort required to go through these times is that which the Lord gives. Thank you for sharing sis. Thank you for your words of encouragement. I personally need it at this time.